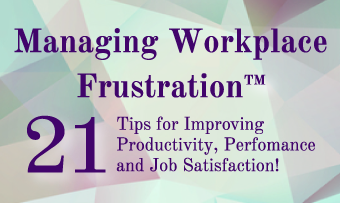 Clients often tell me they are frustrated @ work because they don’t get enough done. Many workplaces are understaffed and people have too much to do. If there isn’t too much to do, there’s anxiety about getting things done on time, or meeting expectations. Even if the expectations are only our own, we want to get things crossed off our lists, and we have our own high standards to adhere to. Supervisors get frustrated too, faced with daily interruptions that require them to solve disagreements or misunderstandings among team members. One solution is to use emotional intelligence skills to mitigate those pesky people problems. Daniel Goleman’s Emotional Intelligence Competencies model shows us exactly what those skills are. His model includes specific personal and social characteristics that determine our success in life—regardless of our definition of success. Goleman’s Personal Competencies include Self-Awareness and Self-Management, and his Social Competencies consist of Social Awareness and Relationship Management, and each category includes specific competencies like emotional self-awareness, initiative, empathy, and influence. For a complete list, go here . Be aware that checking some boxes in the various categories may not be enough to eliminate your interpersonal conflicts entirely! And you’ll also need to have some skills in each category to develop your overall competency in emotional intelligence. Next Article Next Article: A Great Day @ Work!